His week brought the shocking news that time is up for the Twelfth Doctor. Peter Capaldi will leave Doctor Who this Christmas, making the way for a new regeneration in 2018. But instead of looking forward and wondering who’s next, we decided to take a look back at the moments that made Peter Capaldi such a remarkable Doctor. It takes a certain kind of actor to roll up into one of the biggest, fist-pumping moments of Doctor Who’s 50th anniversary celebration and confidently steal the spotlight from the combined talents of Matt Smith, David Tennant, John Hurt, and edited facsimiles of every incarnation of the Doctor before them. But it takes Peter Capaldi to do all that with a single, tightly-focused glower. The Doctor may be many things, but he’s rarely subtle. Capaldi’s Twelfth took this to its logical conclusion by entering a 12th-century duel by playing electric guitar on a tank. Somehow, the fact he also decided he needed to wear sunglasses to make it extra-cool is our favourite part of this. The big thing going into Capaldi’s tenure was that he would be a “dark” Doctor, but that slightly more sinister take on the Time Lord didn’t mean he couldn’t just be plain grumpy when expressing himself, like constantly telling everyone around him to shut it. This supercut only covers his first season and it’s still pretty comprehensive. Although by this point he had softened significantly, the more brusque, distant, and emotionally reserved attitude Capaldi’s Doctor took in his early episodes didn’t instantly mean he couldn’t be funny, and he frequently was. Case in point, subtly giving Robin Hood the middle finger and then duelling—and beating him—with a spoon. Part of the brusque nature of Capaldi’s Doctor meant a repeated refrain that, unlike his past selves, he doesn’t do hugs. But when he seemingly bids farewell to Clara at the end of season eight and reveals why, it’s a subtle, quiet, but completely heartbreaking revelation that’s delivered pitch-perfectly. This scene covers all the high points of Capaldi’s Doctor—a portrayal that could, at the drop of a hat, turn between fury, quiet grief, alien silliness, stirring passion, and calm, intimidating anger. He’s somehow both mightily fearsome and emotionally vulnerable in his quietest moments. Doctor Who has long debated the rules the Doctor sets himself in his adventures, but the way Capaldi reflects on it in this scene—expressing his frustration at what he can and can’t do to save people—and then defies those rules, is brilliantly done. It’s suitably dramatic and badass, but it’s the world-weariness in its opening moments that really sells it, with every long year of the Doctor’s life practically heaving from Capaldi’s shoulders. The Twelfth Doctor didn’t spend all that much time with River Song, but Capaldi was still expected to carry the emotional weight of a relationship fleshed out by his two predecessors as if he’d had scenes with Alex Kingston for years. The fact that he does so is remarkable enough, but his display in the closing moments of “The Husbands of River Song” is a masterclass in understated emotion. Kingston bears the load of the dialogue in the scene, but the grief and love and joy Capaldi expresses in a glance, in a tear-slicked eye, is what makes this the perfect end point for the Doctor and River’s story together. It’s criminal that it’s impossible to find this scene from Capaldi’s debut episode in video form online because this is the moment Capaldi cements himself as the Doctor after an episode of post-regeneration doubt. 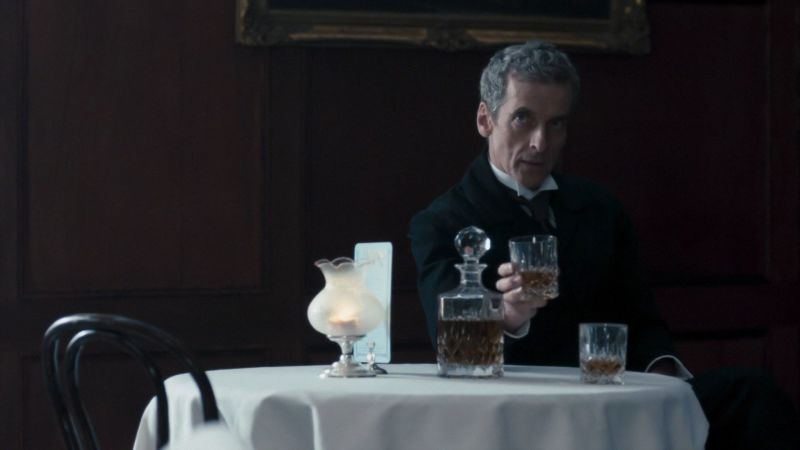 Once again, it’s the understated anger and darkness that comes through—only Capaldi could get away as a Doctor who calmly offers the villain a drink while contemplating whether he’s going to kill him or not, and yet still come off as the hero we’ve known and loved for 50 years. That’s not to say Capaldi’s more traditionally heroic moments aren’t any less great, though. This is one of the first times in his first season that he gets to do the “I’m the hero” speech his predecessors loved, and yet it’s still a thoroughly Capaldian take on it, mixing the compassion and the fury he excels at while still being a totally badass moment of victory. It’s almost unfair to nominate a whole episode, but it’s not every day Doctor Who turns into a pretty much solo affair, with the success of Steven Moffat’s twisty, clever, refreshingly tight script hanging almost solely on Capaldi’s performance, as he had no other actors to bounce off of. And yet, he makes it look easy—the clip above might be the triumphant climax of the episode, but the whole thing is a complete and utterly masterful display of just how Capaldi gets this character. It’s one of the most spine-tingling episodes of Doctor Who in recent memory, and it’s solely down to Capaldi. Give Peter Capaldi a speech, and he’ll give you the performance of a lifetime. This moment, in which the Doctor mediates a meeting between Zygon rebels and UNIT as they stand on the brink of mutually assured destruction, is a tour de force as the rest of the cast involved steps back and give Capaldi the spotlight. It’s stirring stuff, the cries of rage, the moments where his voice breaks as the heartbreak of everything the Doctor has been through comes through, the relentless conviction he sells it all with—echoing into the silence. It’s Capaldi at the very height of his Doctor Who prowess. We still have one more season with the Twelfth Doctor—hopefully one filled with moments as memorable and as remarkable as these—but for now, these are the scenes we’ll look back on fondly as Peter Capaldi’s time on the show comes to an end. If there’s any we missed you want to mention, let us know in the comments below.